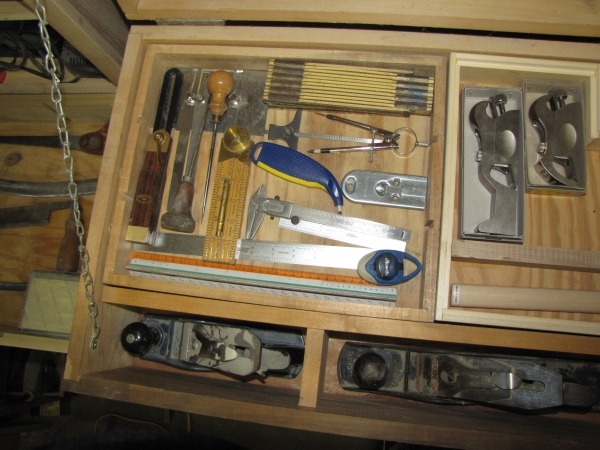 Yesterday, I took every tool that was in my main tool chest out of the box and cleaned and vacuumed out the box. 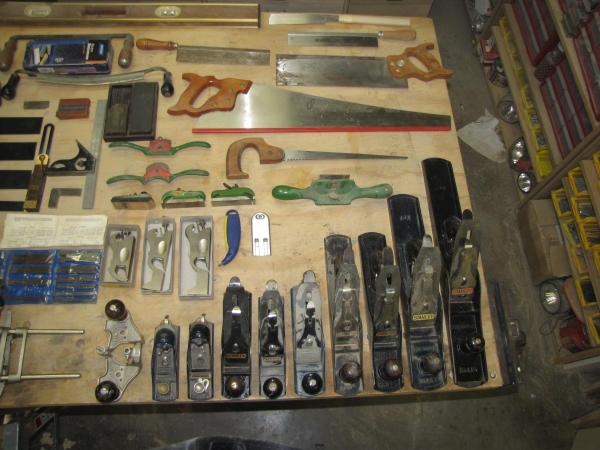 While I was at it I laid my tools out on the work bench and cleaned and inspected them and took some of the bigger Stanley planes apart one at a time and cleaned all the parts. The iron in three of the planes needed sharpening so I did that before I reassembled them. 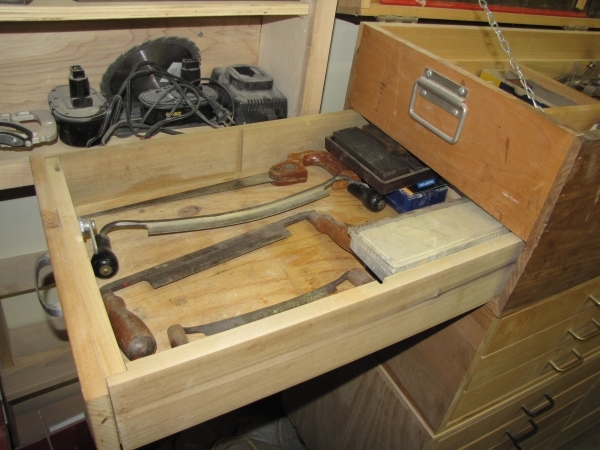 I then put a few of the tools and put them in other drawers instead and put some other tools with these because this is where they should have been but had carelessly not been put back. 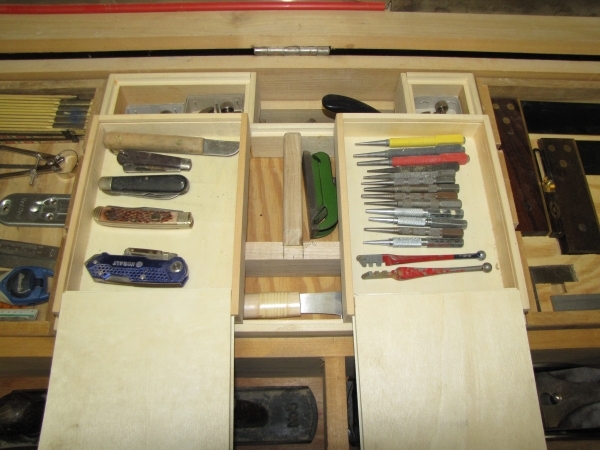 Before I put all of my tools back I decided to make some quick improvements to the box in order for the tools to stay a little more orderly. The box as it looks empty is in my projects section. 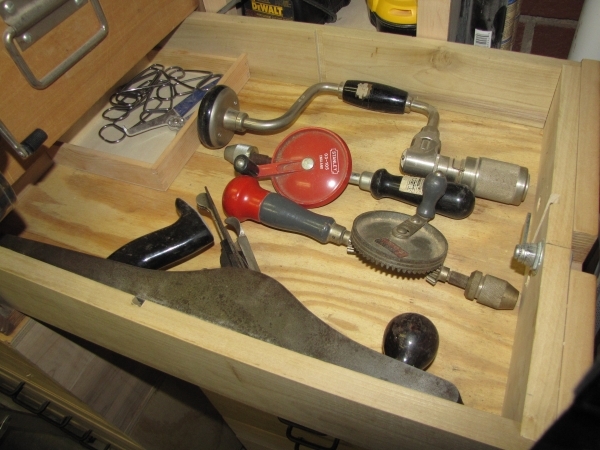 In the two pictures below are the tools that are presently in the box. They are essentially the same as before but are now a little more organized because of a few simple improvements. 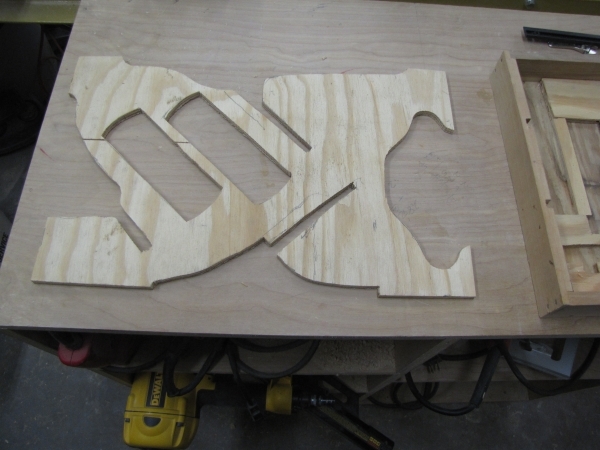 I didn’t have a lot of time to spend on the box but I quickly made a couple of crude separators out of some scrap plywood. The one above is for the box where I keep my squares. It sits above the right compartment just behind the Stanley no 7 plane. This is what it looks like with the squares back in it. The one above is the separator for some of the planes that sit below the squares above. This is the compartment behind the no 7 that is built into the box. 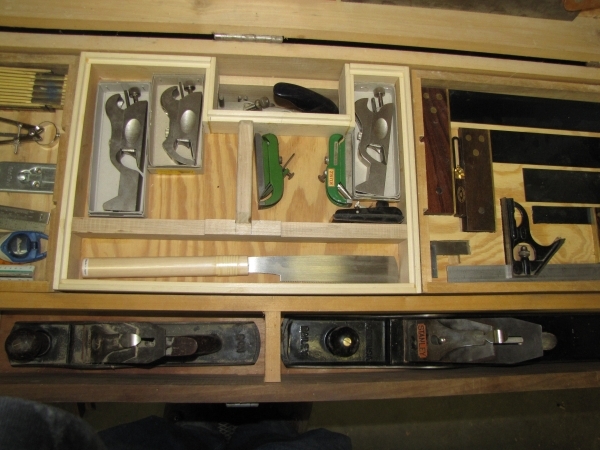 This is what the compartment looks like when the separator is used and the planes are back in the box. 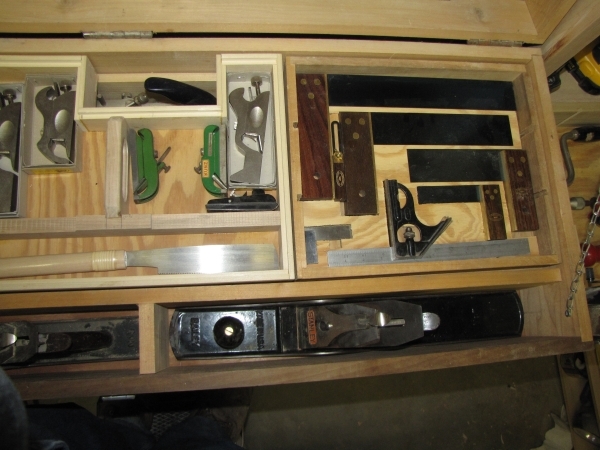 The other quick improvement that I made was to build a tray that would contain my stanley cabinetmakers planes and some other small German planes. The pictures of this new box is shown in several pictures just below. 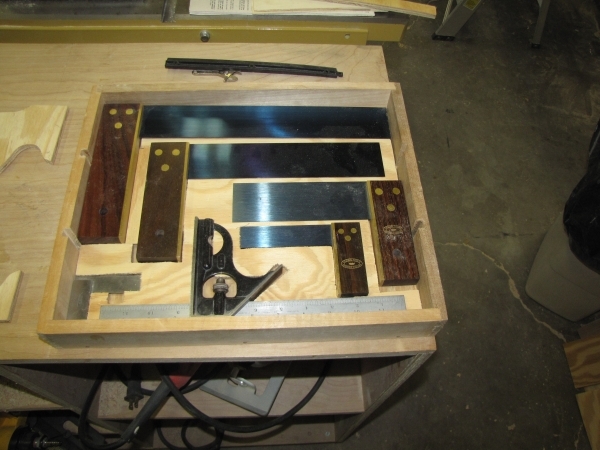 The reason for the ‘notch’ in the box is because the handle of the Record combination plane sticks up pass the ledge that this tray sits on. So I needed clearance for the handle. The two small boxes on either side are some that I had previously bought at Hobby Lobby for $2.99. These are very handy little boxes. Small Boxes With Sliding Lids. These two little boxes sit on the little ledges that are in the notched box above and sit on either side of the handle. The rest of the photos were taken in steps as I placed all of the tools back in the box and should be self explanatory. Brace, egg beaters, no 6 Stanley plane. Draw knives and 3 water stones. 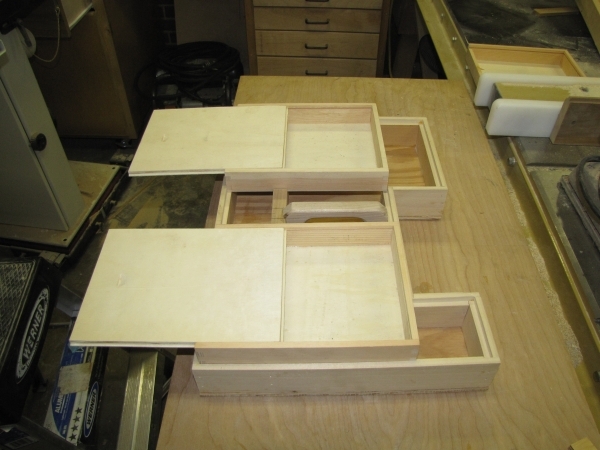 The next pictures are the 3 compartments built into the chest. 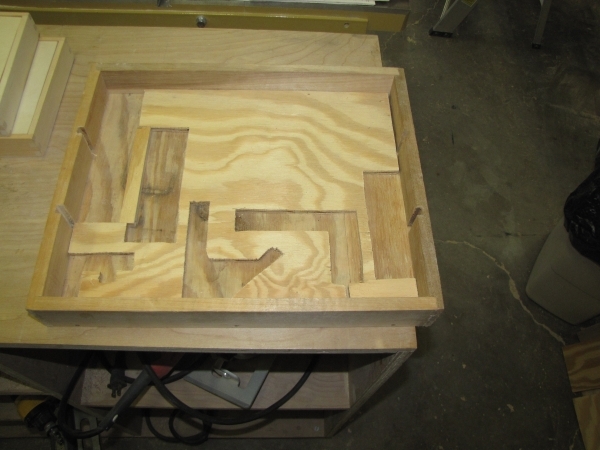 The next three pictures are the three trays that sit above the three compartments in the pictures just above. 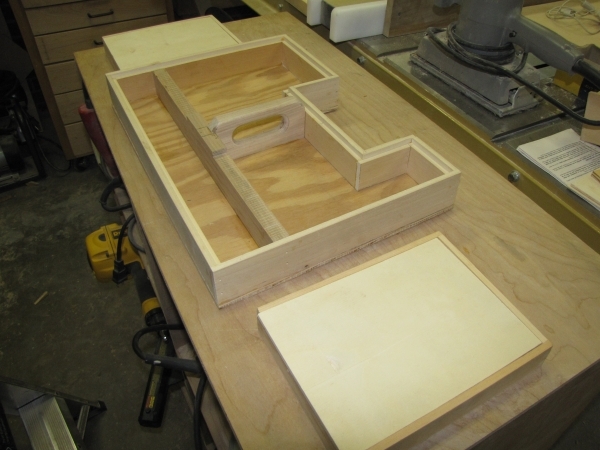 And finally, in the picture below are the two small Hobby Lobby boxes that fit onto the center tray that I built today. In case you are wondering, the overall size of the box is a little over 4 ft. long by 20 inches wide by 16 to 18 inches tall with top down. 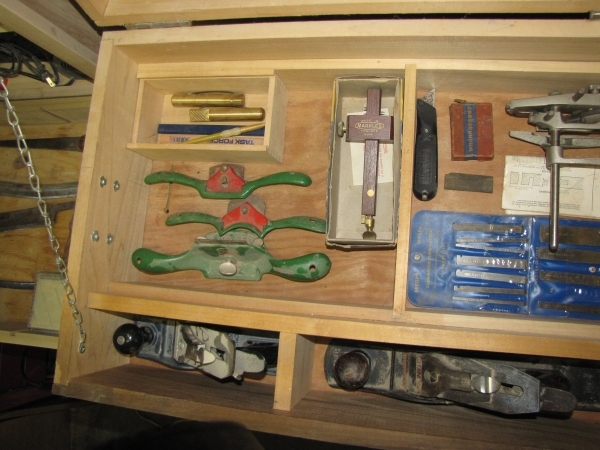 This box was not made to look pretty but just to store my tools. It’s just made out of poplar, has plain hardware, has no finish, nor any special joinery. It is a very strong box and has been moved plenty of times. It does take two stout men to pick it up. I built this box about 14 years ago on one Sunday and it took about 5 hours. The trays were added later. And yesterday I added the improvements that I explained above. 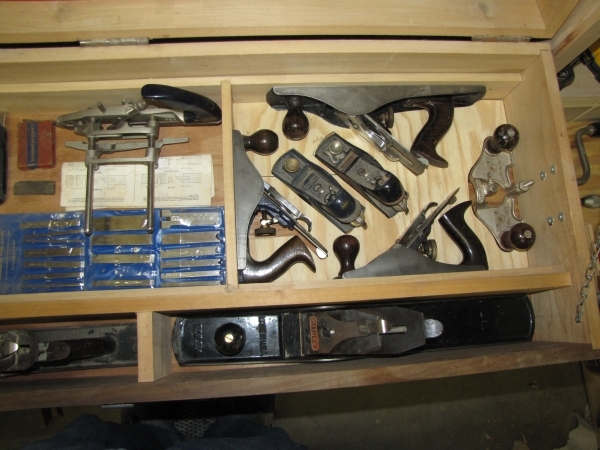 Good Lord, and i thought i loved to collect hand tools and continually pamper my collection. 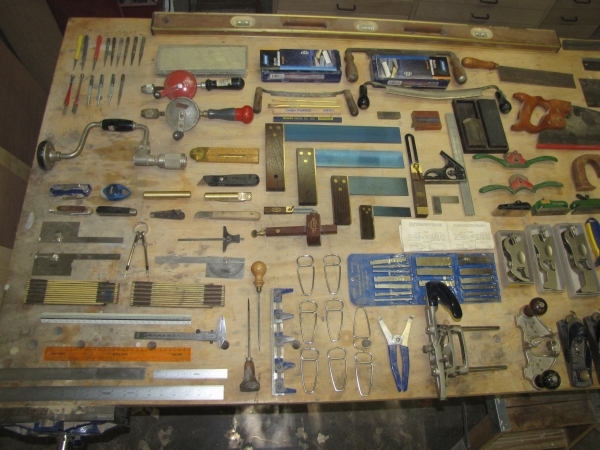 Nice collection – i’m jealous, you certainly have what you need to make most projects look nice. Cool setup and toolbox build, i’m impressed. My God you have an incredible collection of hand tools. 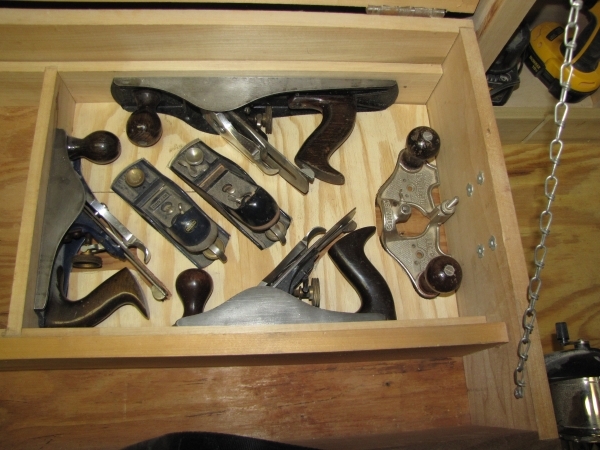 I am just beginning to collect hand planes and really appreciate what you have here. Thanks for sharing your collection. 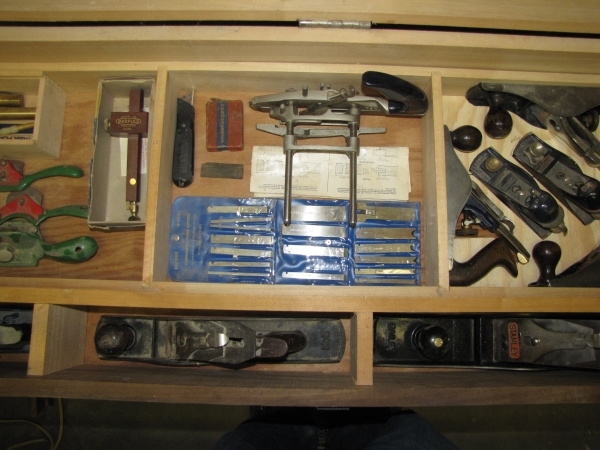 Welcome to my blog, Woodworking Expo. I'm a proud member of Lumberjocks.